What happened? Canada lost sight of Laurier’s plan, and failed to claim its century, dwelling instead in the long shadow of the United States. In a bold, fascinating and thought-provoking call to arms, Crowley (author of the national bestseller Fearful Symmetry) and co-authors Jason Clemens and Niels Veldhuis envision Canada’s emergence as an economic and social power. While the United States has been squandering its advantages — including making a series of bad decisions that precipitated a global economic disaster from which it struggles to emerge — Canada finds itself on a path leading out of the shadows and into a new prosperity that could — if we stay the course — make us the envy of the world. 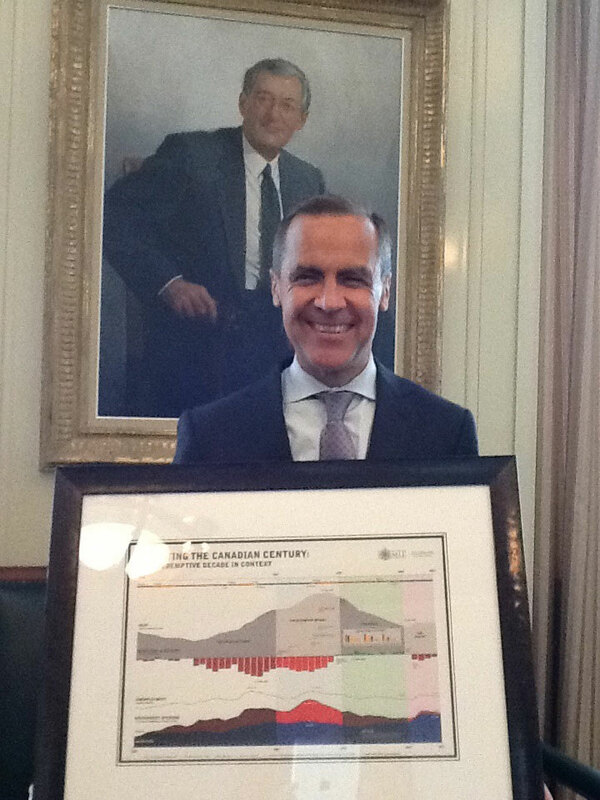 May 27, 2013 – Bank of Canada Governor Mark Carney, who will be leaving at the end of the month to become the Governor of the Bank of England, is a big fan of MLI’s award-winning book, The Canadian Century. 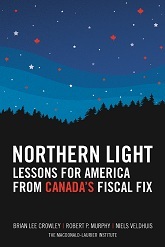 As a going away gift we presented him with a framed copy of the infographic which summarises the book’s story, and formed the backbone of the two videos we produced telling the story of Canada’s fiscal reforms to both Canadians and Americans. Mark Carney, widely regarded as the “steady hand” that helped keep Canada’s fiscal position strong throughout global economic slowdowns and crises, says he will proudly display the infographic in his new office at the Bank of England. It is refreshing and encouraging to see these important policy thinkers in our country pointing out that Canada doesn’t need to take a back seat to anybody, and that our fate lies within our own hands if we have the courage, the energy and the enthusiasm to grasp it. It is not often that Canadians talk about moving out of America’s shadow—for far too long we have simply assumed that being in that shadow was the natural order of things. Crowley, Clemens and Veldhuis remind us that Sir Wilfrid Laurier thought that all things were possible for us, and today they show, with an impressive array of facts to support their argument, that Laurier’s plan for Canada can still carry us through to that Canadian century we have all been eagerly awaiting for over a hundred years. Crowley, Clemens and Veldhuis tell a compelling tale of Canada’s economic policy history over the past 100 years from the perspective of Sir Wilfrid Laurier’s vision. Many Canadians will be familiar with Laurier’s boast that “the twentieth Century would be filled by Canada”. There will be less familiarity with his policy prescriptions and hence perhaps scepticism that the authors’ approach can work. But it works exceedingly well. First because Laurier’s ideas, once highly controversial, now seem so sound. Who now doesn’t believe in individual freedom and responsibility; competitive taxes with fiscal balance and; self-confident engagement with the United States? Second because the authors strike exactly the right balance with enough detail to keep the most ardent policy wonk captivated while writing in a breezy style that will engage non-economists. And as with a good novel the authors leave us in suspense. The policy successes of the Redemptive Decade, highlighted by the federal and provincial governments slaying their deficits, have put Laurier’s vision of Canadian world prominence back into our grasp. But some serious challenges, including the return to deficits and Canada’s ailing productivity performance, make that grasp a bit shaky. I urge people to read this compelling tale and then like me, anxiously wait for a sequel to see how the story ends. The Canadian Century reminds us that the temptation for governments to solve all our problems with higher spending always ends in grief – a lesson the US will soon learn. It’s a reminder that prosperity can be ours if we remember Wilfrid Laurier’s legacy of liberty, lower taxes and smaller government. Crowley, Clemens-Veldhuis draw an intriguing link between the 19th Century convictions of Wilfrid Laurier – individual liberty and responsibility, minimal taxes and rules, maintenance of an open, competitive edge vis-à-vis the US – and the policy prescriptions needed to ensure a brighter 21st Century for Canada. Their thoroughly documented analysis of the “redemptive decade” which ushered in Free Trade, the GST and deficit control demonstrates how Canada has acted in its own best interest. Moreover, they show that if we establish a real advantage vis-à-vis the US on tax and other policies that will increase both our attraction with emerging powers and our leverage with the US. The question the authors pose is whether we have the wherewithal to finish the job. The Canadian Century: Moving Out of America’s Shadow will be out in May, 2010. You can pre-order your copy from Amazon.